I love a good road trip. The scenery, the tunes and audiobooks, the snacking and stops for ice cream…all good stuff. But the very, very best part of road-surfing one’s way through a vacation? The primo knitting time. 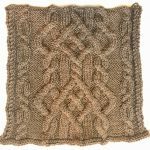 Hours and hours of uninterrupted, guilt-free knitting. Pure bliss. This year, our main vacation ended up split into two segments – First Vacation and Second Vacation – with two working days dividing them. 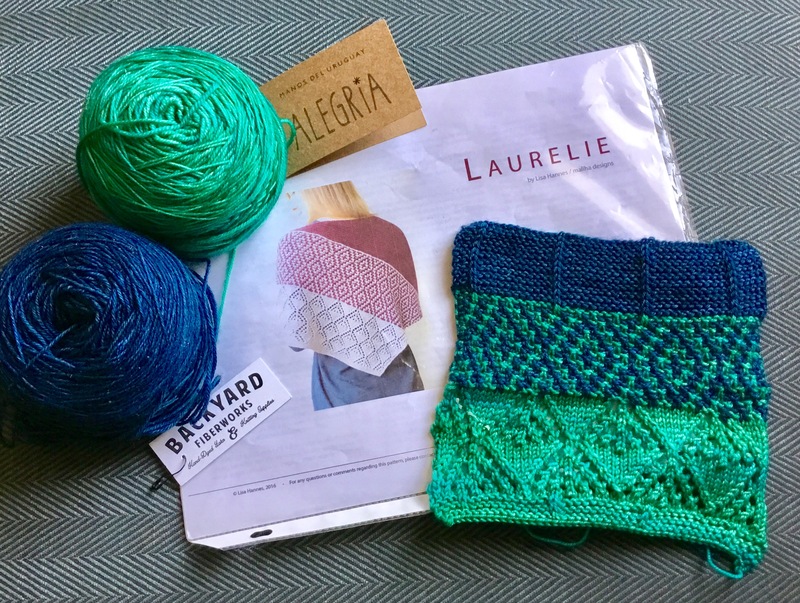 As I write this, we’re a few days into Second Vacation, but this post is all about First Vacation knit-ventures. Over a 12 day trip, the wheels of our car rotated their way over 4,000 kilometers of highway. As you can imagine, I got a fair bit of sh- I mean, stuff done. I packed several projects for the 12 days away, at least 5 of which were spent mainly holed up in the car. 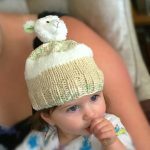 On our first leg, from Vancouver up to the Okanagan, I whipped up two terribly cute hats for the tiny grand-type people who were on the agenda to visit during the trip. Well over a year ago, I bought these DMC Top This! kits, which have been languishing in a cupboard waiting patiently for the right timing. Lucky for them, I recognized their car-knitting potential and tossed them in the bag. Super adorable, yes? And are they soft? Oh, yes siree, Bob, they are. And are they quick? Soooo quick, they would make your head spin – less than two hours a pop. Pretty big bang for one’s buck. In fact, such a big bang that I’ve ordered 9 more kits from Amazon. Nope, not a typo – NINE more: bunny, kitty, giraffe, monkey, owl, bear, frog, penguin, and butterfly. One tip, in the event my enthusiasm is contagious…they fit small. 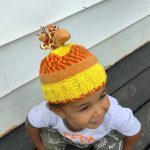 Little giraffe-head over there is wearing the adult small (two sizes provided in the ball band pattern – toddler and adult small) and it barely fits him – he’ll be two in a couple weeks. The baby (she’s almost a year) is wearing the toddler size. Hopefully, it fits her for the coming winter. Also in the travel mix was a determined effort to finish this “summer” sweater that I started, like, back in May or something – ha! I’ll be lucky if I get two weeks of summer wear out of it. 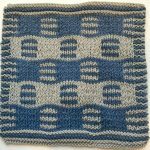 It’s a nifty little pattern that I snagged out of one of those British knitting mags (can’t recall which one at the moment – I’ve been knitting from photos of the pattern pages). 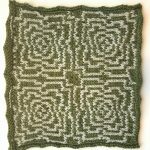 The yarns are Katia Cotton Comfort (white) and Schoppel Wolle Zauberball (green/gray gradient). I’m really loving how it’s coming together and the stretch in the Cotton Comfort means that it will hold its shape well. I should have finished this on the last trip, but I failed to bring extra yarn and ran out before I could finish the sleeves. Sigh. So, here I am on second vacation, still plugging away at the sleeves. I’ll give you more deets on the process and such when I post the finished object. I’m madly in love with it. I drag it everywhere with me. It’s my desk cozy, when the A/C gets to be a bit overzealous. Two gorgeous fingerings from my stash plus a garter/mosaic/lace design = a thing of beauty – at least, that’s what the swatch is suggesting. Perhaps I’ll get to this later in Second Vacation, while we are languishing at a lush B&B on Vancouver Island. 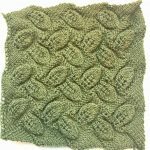 Of course, I have much more “catch-up” knitting to share since I last posted back in April, which I intend to do over the next week or so, while I’m still a free agent. In the meantime, knit well and often, and let me know about your vacation knit-ventures. 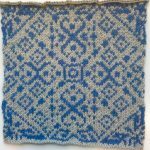 I enjoyed reading your post and your projects are lovely!